Public Art - The McLean Fountain, the Longhorn and the Keeper of the Plains. Museums on the River - from Exploration Place and the Indian Center to Cowtown and Botanica. Sports - Get into a baseball game at the West Side Athletic Field. Recreation - Spend some time at the Wichita Ice Center or at one of the game rooms. Delano is a great place to spend time. There are parks, fountains and monuments to explore. There are all sorts of unique stores to shop in. There are buildings with fantastic architecture such as the Kansas Masonic Home and Davis Hall at Friends University. If the parks, shopping and interesting architecture aren't enough to keep you busy, Delano is located in close proximity to the Museums on the River. Or you could take in a Wingnuts Baseball game at Lawrence-Dumont Stadium or a Thunder Hockey practice at the Wichita Ice Center. So come on down, and "Do Delano!" Delano Park - 101 N. McLean Blvd. West Side Athletic Field - 571 N. McLean Blvd. - at Meridian and McLean Blvd. 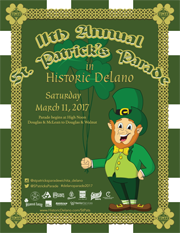 Historic Delano assists with several annual events.